Description: Helmeted guineafowl are very distinct with a large dark grey and white spotted body, white featherless face and reddish knob or helmet on the top of their small head. Weighing 0.7kg - 1.6kg (1.5lbs - 3.5lbs) and having a wingspan of 150cm - 180cm (59in - 71in), these birds have no marked differences between males and females. 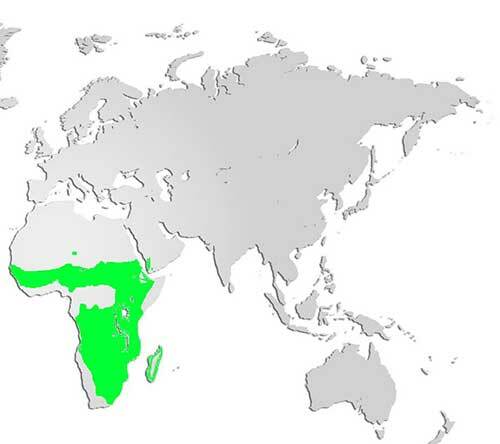 Distribution and Habitat: Native to sub-Saharan Africa, these fowl have been raised for food for centuries and have been introduced as both an agricultural and ornamental bird around the world, including North America. In the wild, guineafowl live in varied habitats which make them hardy and adaptable to many environments. 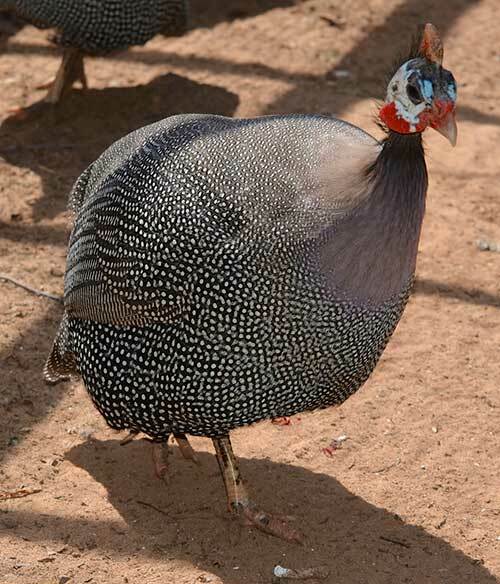 Diet: Ground feeders, guineafowl spend their days in flocks, busily scratching in pursuit of their omnivorous diet of seeds, berries, worms, insects and sometimes small mammals. Life Cycle: Female guineafowl build a nest of grass and twigs on the ground and incubate a clutch of 6 – 10 eggs for about 30 days. Newly hatched guineafowl are very small. Known as “keets”, the young follow their mother until they are big enough to fend for themselves. Did you know? Although they prefer to stay on the ground, they are strong flyers and can even fly backwards.